Seasonal Promotion! Click Or See Below To Save Up To $20 Per Month Off Our Monthly Pool Service Rates!! Our pool service technicians fill out and leave chemical logs at every pool or spa, so you know when your service date was and what your chemical levels tested at. We also have customized pool water chemistry plans for each pool or spa for optimum longevity of your pool or spa water. You can find more details about our expert pool water chemistry strategy in our pool school section where our founder writes expert articles to help you enjoy and use your swimming pools or spas as much as possible. We only perform pool service in cities we know we can achieve the highest quality of pool service, so we don’t over-expand and limit our quality. Do you have an automatic cleaner? Are you open to certain days of the week? We Have Several Discounts That Can Save You Up To $20 Per Month! Call, text, or email to set up a free, polite, no obligation, monthly pool service appointment! Professional chemical balancing every service visit. Includes chlorine and acid. Our most popular plan and meets the expectations of our most demanding customers. Please click policy sheet above to learn about our vacation schedule, rain policy, extra chemical fee, filter cleans, and other important policies. Weekly pool cleaning service June through August and twice a month pool service September through May. Includes a suction side, automatic pool cleaner rental to be returned back to us when service terminates. Professional chemical balancing every pool service visit. Includes chlorine and acid. Only available in certain areas. Please click policy sheet above to learn about our vacation schedule, rain policy, extra chemical fee, filter cleans, and other important policies. Twice a month pool cleaning service year round. Our most popular and recommended pool cleaning plan. Warm pool water and regular swimming use require weekly pool service. Rain, wind, and more use in the summer can be very challenging for most pools which is why our weekly pool cleaning is always the best bet. Click on policy sheet to read about our policies. 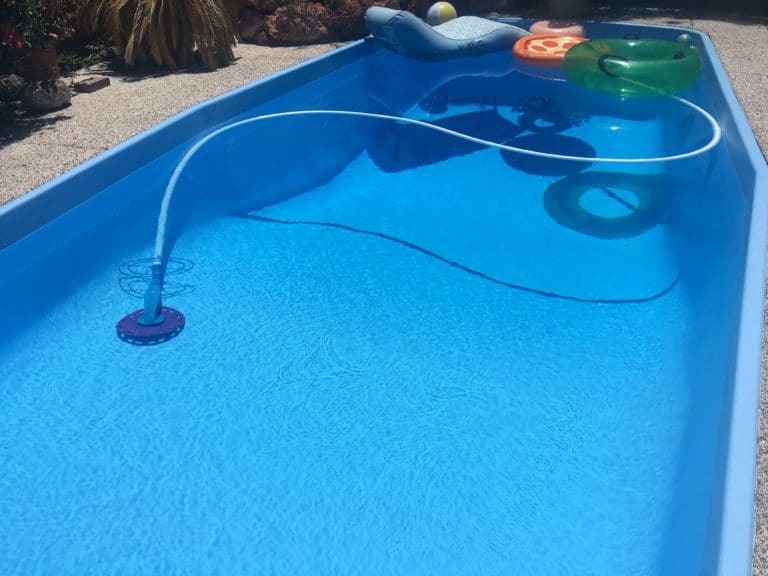 Our Seasonal Weekly pool cleaning plan is a budget fitting option for those swimming pools and customers that are less demanding. This plan works for small pools with minimal landscaping and trees. Minimal use is also necessary with this pool cleaning plan until June through August when we come weekly. Our every other week pool cleaning plan works with small pools with minimal landscaping and trees. Low use is necessary with this plan as well. This pool service plan was designed for retired people who rarely use their pool, but want a professional pool cleaning and perfect pool water chemistry. 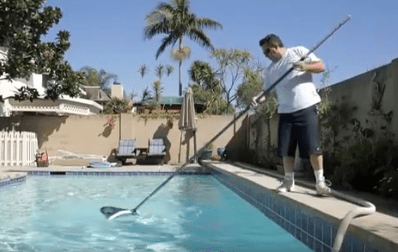 Both of our every other week pool cleaning plans include an automatic suction side pool cleaner rental like the picture to the left. It connects to your skimmer with hoses and vacuums your pool every day. 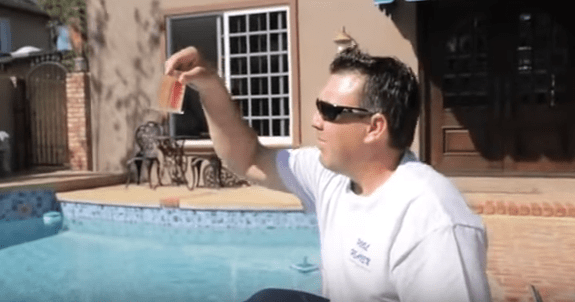 These pool cleaners help keep your pool clean the missed week. Your normal pool filtering powers this pool cleaner and you do not need to worry if you notice it not moving. They will get blocked up with leaves, rocks, twigs, etc. from time to time, but your pool system should be fine, so long as your filter shows adequate pressure on the gauge. Our pool service technicians will notice it is not moving and get it fixed or replaced when they visit next. No extra chemical fee. Please read our policy sheet to learn about our vacation schedule, rain policy, and other important policies. Please read our policy sheet to learn about our vacation schedule, rain policy, and other important policies. We professionally add chemicals and balance your pool water chemistry if you can keep your pool clean. You will enjoy professionally managed pool water all the time. Spas require the perfect amount of chemicals every time. Due to high body mass to water ratio, a little bit too much or little of chemicals can lead to aggressive spa water. For this reason, weekly service is the recommended plan.